Mrs. Meyer's Holiday Scents are here! | Get Your FREE set! It’s that time of year again! Our house is buzzing with activity and plans…hosting out-of-town guests, to throwing holiday parties, to wrapping gifts and decorating the mantel. 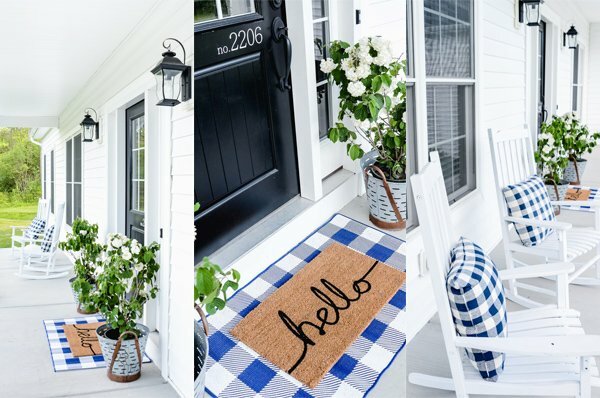 Not surprisingly, my desire to have a clean, welcoming home intensifies tenfold in November. Fortunately, it’s also the time of year when Mrs. Meyer’s holiday scents return! Not only do they look and smell festive, they also make the task of cleaning and doing dishes a lot more enjoyable! I absolutely LOVE Mrs. Meyer’s holiday scents, and I look forward to them coming back every single year. 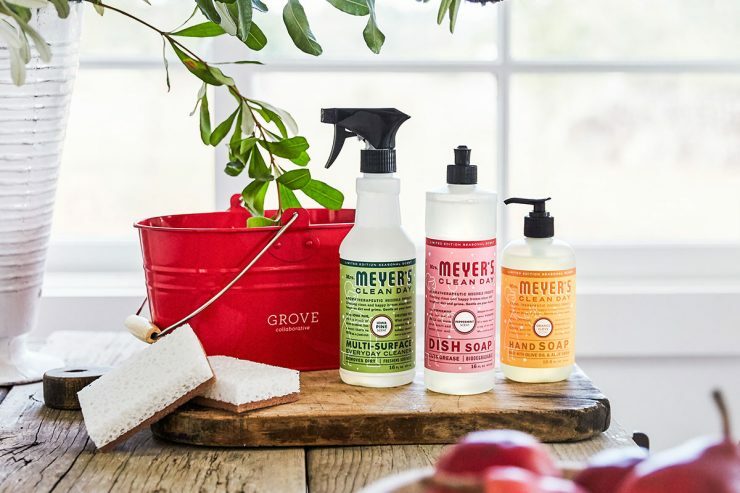 FREE Mrs. Meyer’s Holiday Set from Grove Collaborative! This year, Mrs. Meyer’s is bringing back three crowd favorites: Iowa Pine, Peppermint, and Orange Clove. I’ve been waiting all year for Iowa Pine to return, because the crisp and spicy scent fills the entire house with wonderful smells of Christmas trees. But I just can’t decide on a favorite, because I ADORE the Peppermint!! I use them in my kitchen, laundry room, and all the bathrooms–not only do they smell amazing, but the packaging is so darling that they add to the overall decor of each space. Speaking of holiday buffets, there’s no shortage of dirty dishes this time of year. Fortunately, Mrs. Meyer’s dish soap is perfect for tackling tough messes. Put a drop in your roasting pan or crockpot and watch grease disappear! 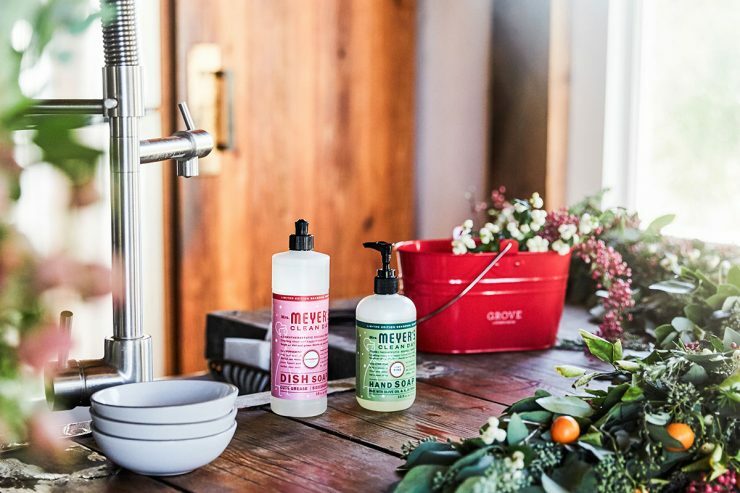 Of course, no kitchen or bathroom is complete without Mrs. Meyer’s hand soap. I get tons of compliments on these scents, and the cheerful bottles are an easy way to spruce up your sink-side display. 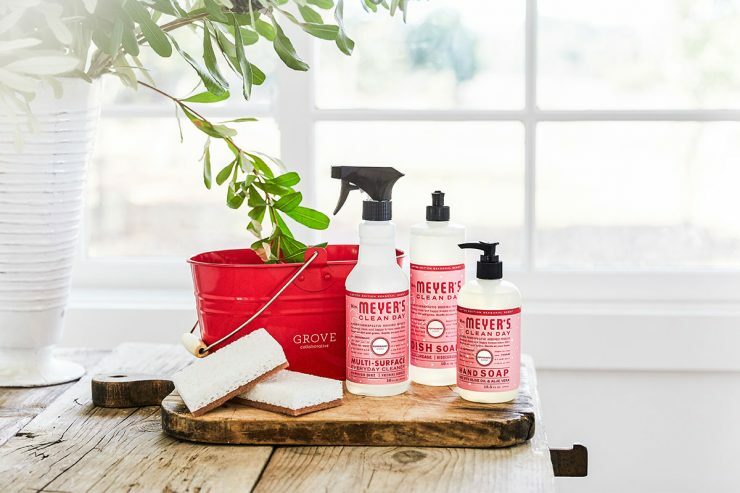 Another holiday hosting must-have is Mrs. Meyer’s multi-surface cleaner. It’s ideal for those last-minute cleanups before guests arrive. You only need one product for countertops, walls, bathroom fixtures, and wood or tile floors. Plus, it leaves your entire home smelling like the holidays. Since the holiday season is also flu season, I always keep the multi-surface spray on hand for wiping down faucets, doorknobs, and other surfaces that get touched all the time. Grove Collaborative is also an essential for me during the busy holiday season! 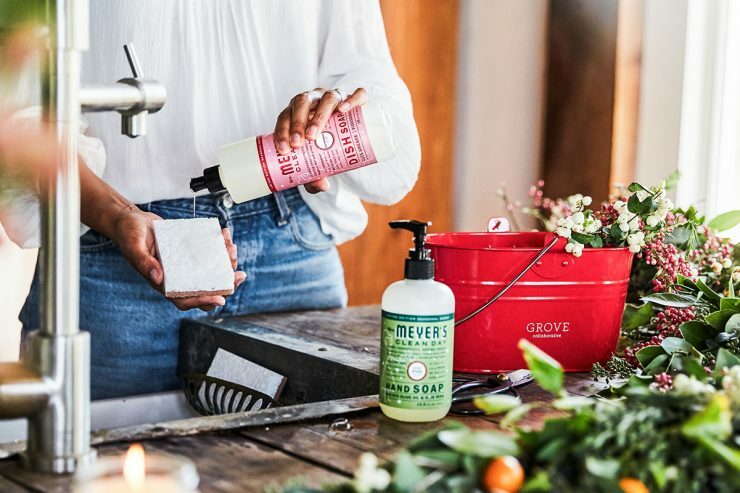 Grove hand-selects the best natural products and delivers them (carbon offset) right to your doorstep, on your schedule. They’ve got you covered for all your cleaning and organization needs as you head into the holiday season. Don’t forget to stock up on hand soap, toilet paper, and paper towels before your guests arrive! When you submit your first order, you’ll also be signed up for the free 60 day VIP trial. For 60 days, you’ll save even more with free shipping, free gifts, price matching, exclusive sales and customer service. That means more money left over to spend on gifts for your family (or a little treat for yourself!). Sign up for Grove Collaborative here! You will receive the Holiday Scents set for free when you sign up! I’m so sorry that’s happening, Teresa! I would refresh your browser, or maybe try a different one. Hope that helps! Never used. Does the cleaning sprays , last or, does the scent fade away quickly? Tana.voshall@aol.com. Also how long does a bottle of spray ( all purpose cleaner) last? In my experience, the scent stays for a good amount of time. To be honest, I use it quite a bit though, lol–so there’s not a lot of time in between uses. :) Some scents are stronger than others–I really like the peppermint and the pine–and the apple cider from their fall line. And as for how long it lasts, it really depends on how much you use it. I go through a bottle of the cleaning spray in 4 weeks, and dish soap in about that same amount of time. Hand soaps last a little bit longer–and sometimes I have enough to keep them until the following year.